Stuttgart, Germany - September 26, 2018 - The regular expiry of the term of office of the Chairman of the Supervisory Board, Dr. Manfred Bischoff, is at the end of the Annual Shareholders' Meeting in 2021. Daimler sets its course for the future: Dieter Zetsche to succeed Manfred Bischoff in the Supervisory Board - Ola Källenius to become Chairman of the Board of Management of Daimler AG in 2019. Four future-oriented fields are set to radically change the nature of mobility: greater vehicle connectivity, advances in autonomous driving, the development of digital mobility and transport services, and electric mobility. Our goal as one of the leading vehicle manufacturers is to become a leading provider of mobility services. Every strategic action revolves around one thing, the customer. So also for the future, we will only be as successful as our products and services are in the market. The regular expiry of the term of office of the Chairman of the Supervisory Board, Dr. Manfred Bischoff, is at the end of the Annual Shareholders’ Meeting in 2021. In view of the challenges presented by the transformation of the automotive industry, the Supervisory Board intends to prepare a suitable succession at an early stage. The new S-Class: The next big step toward fully autonomous driving. 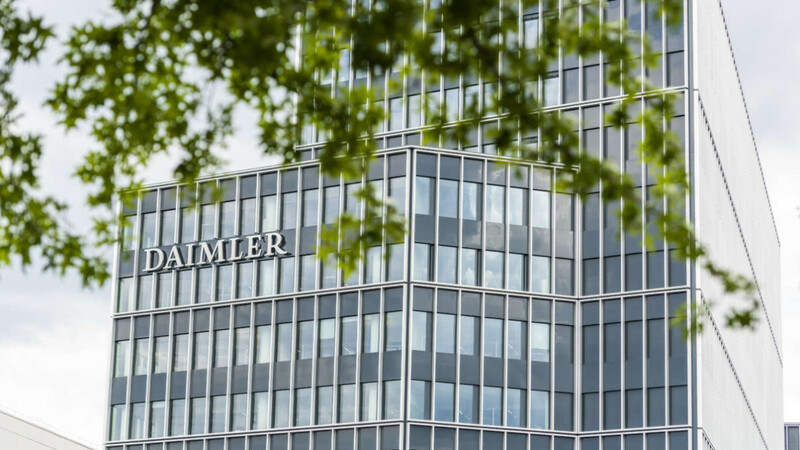 The Supervisory Board of Daimler AG intends to propose to the shareholders at that meeting that Dieter Zetsche be elected as a member of the Supervisory Board. Manfred Bischoff will recommend the election of Dieter Zetsche as his successor as the Chairman of the Supervisory Board, taking effect at the end of the Annual Shareholders’ Meeting in 2021. Dieter Zetsche has been a member of the Board of Management since December 1998 and was appointed Chairman of the Board of Management of the former DaimlerChrysler AG in January 2006. In addition, he has been Head of the Mercedes-Benz Cars division since 2005. In order to comply with the two-year cooling-off period, Dieter Zetsche will therefore step down from his position in the Board of Management of Daimler AG and as Head of Mercedes-Benz Cars effective at the end of the Annual Shareholders’ Meeting in 2019. Dieter Zetsche and Federal Chancellor Angela Merkel. 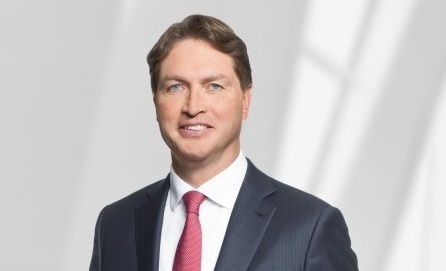 In its meeting today, the Supervisory Board of Daimler AG therefore decided to appoint Ola Källenius for a new term of five years as Chairman of the Board of Management of Daimler AG, effective in direct connection, and also to appoint him as the Head of the Mercedes-Benz Cars division. Dieter Zetsche and Federal Chancellor Angela Merkel, and Deputy Prime Minister of the federal state of Baden-Wuerttemberg Thomas Strobl. 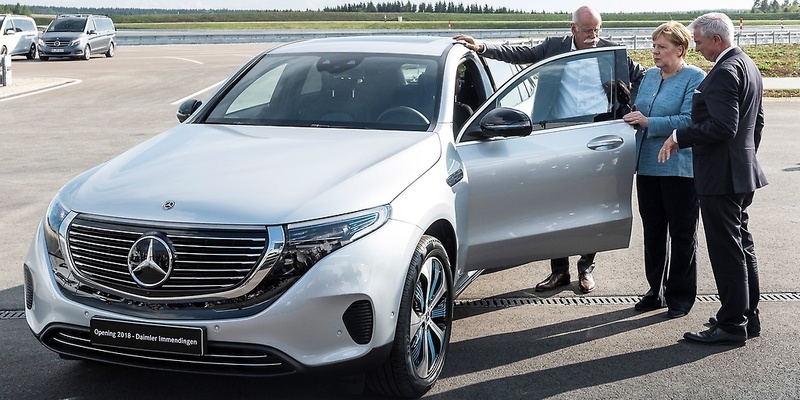 “As a long-standing member of the Board of Management and Chairman of the Board of Management, Dieter Zetsche has played a key role in shaping Daimler AG and has ensured its strategically outstanding positioning for the mobility of the future. His expertise and experience are extremely valuable for our company. Dieter Zetsche is predestined also to lead the company’s Supervisory Board prudently and successfully. 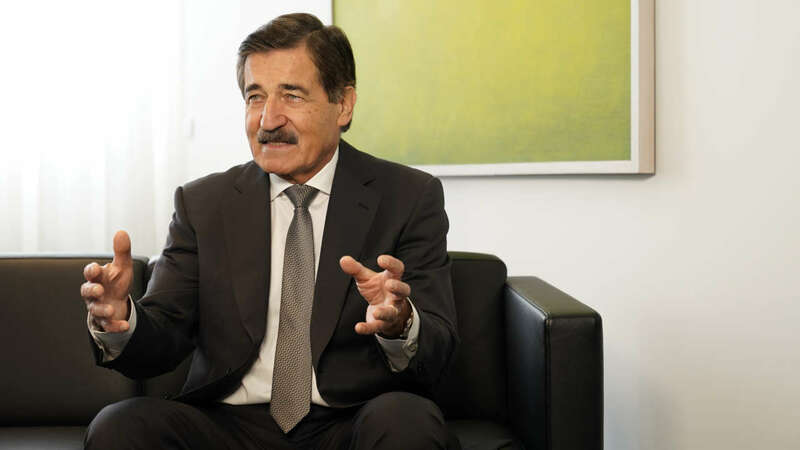 As Chairman of the Board of Management, he has proven that he can lead Daimler AG also in difficult circumstances and can inspire employees to pursue ambitious goals. With Dieter Zetsche’s intended appointment as Chairman of the Supervisory Board, we are ensuring continuity for the sustained success of Daimler AG. In Ola Källenius, we are appointing a recognized, internationally experienced and successful Daimler executive as Chairman of the Board of Management of Daimler AG and Head of Mercedes-Benz Cars. 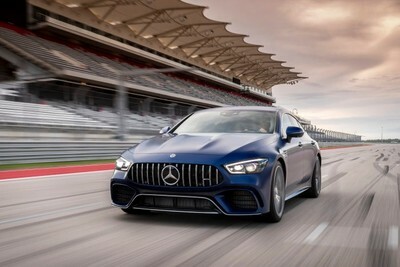 At the same time, we are relying on the proven dual responsibility of the Chairman of the Board of Management as the head of the largest division, Mercedes-Benz Cars,” stated Manfred Bischoff, Chairman of the Supervisory Board of Daimler AG. Manfred Bischoff, Chairman of the Supervisory Board. Ola Källenius, Member of the Board of Management, responsible for Group Research and Mercedes-Benz Cars Development. 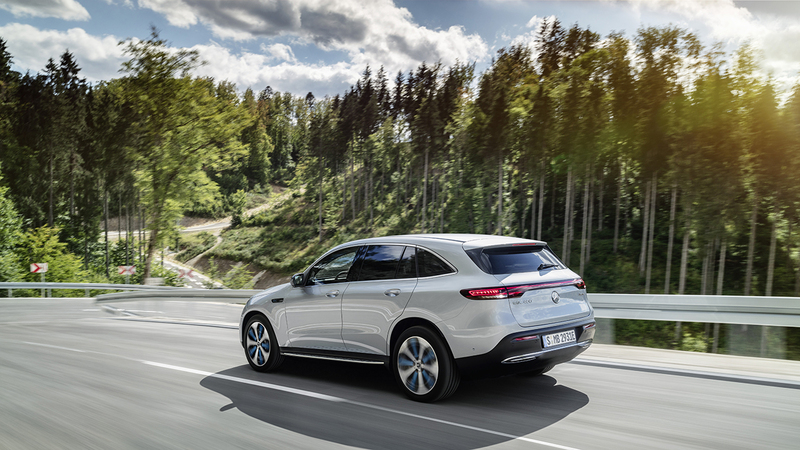 All-electric EQC (combined power consumption: 22.2 kWh/100 km, combined CO2 emissions: 0 g/km — preliminary data. Further information is available in a blog entry by Dieter Zetsche at the Daimler blog. The Supervisory Board has decided to appoint Markus Schäfer as the successor of Ola Källenius with responsibility for Group Research and Mercedes-Benz Cars Development in the Board of Management of Daimler AG. 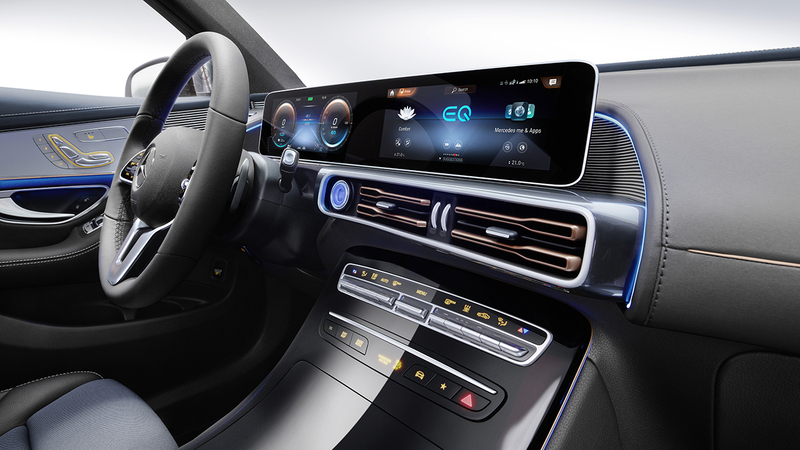 All-electric EQC - interior (combined power consumption: 22.2 kWh/100 km, combined CO2 emissions: 0 g/km — preliminary data. Markus Schäfer has displayed outstanding leadership qualities and strategic farsightedness in various technical management positions at the Mercedes-Benz Cars division. He was appointed to the divisional board of management of Mercedes-Benz Cars in January 2014 and has been responsible for Production and Supply Chain Management since then. His contract of service was extended in 2017 until February 2022. Ola Källenius, Member of the Board of Management of Daimler AG. Group Research & Mercedes-Benz Cars Development. Ola Källenius was appointed to the Board of Management of Daimler AG effective January 2015 and is Member of the Board of Management for Group Research and Mercedes-Benz Cars Development since January 2017. In February 2017, the Supervisory Board of Daimler AG extended his contract by five years until the end of December 2022. In February 2016, the Supervisory Board extended Dieter Zetsche’s contract by three years until the end of December 2019. 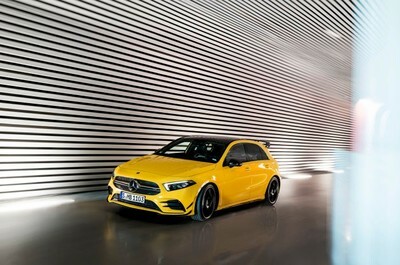 The new Mercedes-Benz A-Class Saloon: Compact point of entry to the world of premium saloons. Fuel consumption combined: 6.7-4.3 l/100 km; combined CO2 emissions: 153-113 g/km. Manfred Bischoff has been a member of the Supervisory Board since 2006 and has been its Chairman since 2007. In 2016, the Supervisory Board reelected Manfred Bischoff as its Chairman until the end of the Annual Shareholders’ Meeting in 2021. Mercedes-AMG GT 4-Door Coupé: A class of its own. Fuel consumption combined: 11.3-9.4I/100 km; combined CO2 emissions: 257-215 g/km. 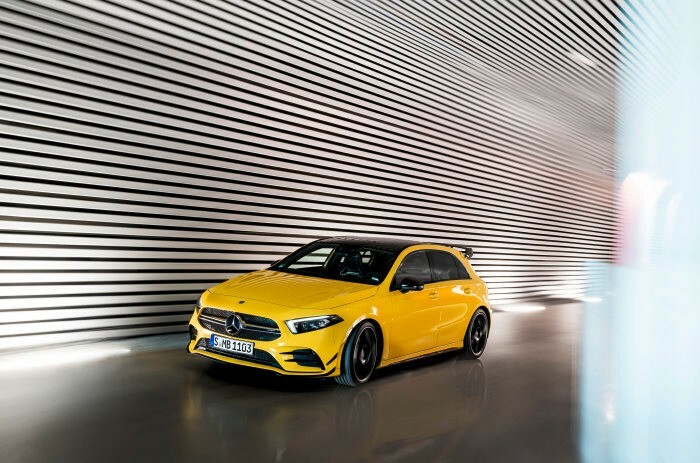 The new Mercedes-AMG A 35 4MATIC: New entry-level model opens up the world of driving performance. Combined fuel consumption 7.4-7.3 l/100 km; combined CO2 emissions 169-167 g/km. 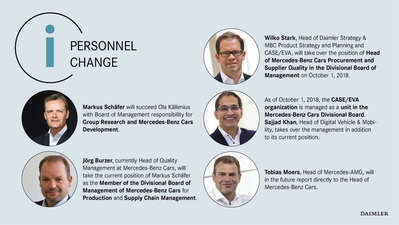 As a result of these personnel decisions by the Supervisory Board and the resolutions of the Board of Management of Daimler AG, the following appointments have been made at the Mercedes-Benz Cars division: Jörg Burzer, Head of Quality Management at Mercedes-Benz Cars, is to be the successor of Markus Schäfer. The new Mercedes-Benz GLE: The SUV trendsetter completely reconceived. 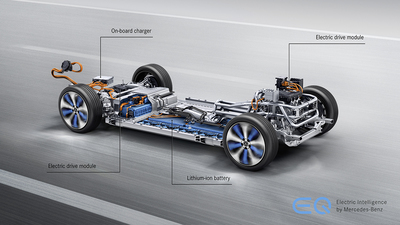 Fuel consumption combined: 9.6 – 8.3 l/100 km; Combined CO2 emissions: 220 - 190 g/km. 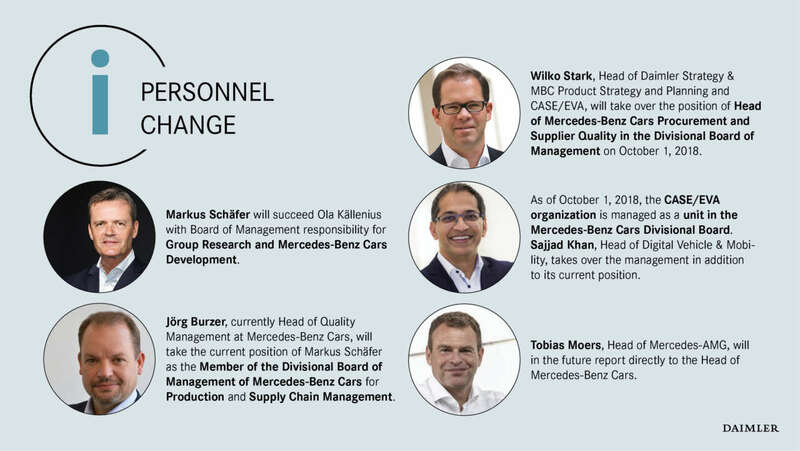 Wilko Stark, until now Head of Daimler Strategy and MBC Product Strategy and Planning & CASE, will take over the position of Head of Mercedes-Benz Cars Procurement and Supplier Quality on October 1, 2018. As of October 1, 2018, the CASE/EVA organization is managed as a unit in the Mercedes-Benz Cars Divisional Board. Sajjad Khan, Head of Digital Vehicle & Mobility, takes over the management in addition to its current position. As of October 1, 2018, Tobias Moers, CEO of Mercedes-AMG GmbH, will report directly to the Head of Mercedes-Benz Cars to reflect the growing importance of this business. All-electric Mercedes-Benz truck for heavy-duty distribution : Start of practical customer trials: The Mercedes-Benz eActros is entering operation with Hermes. 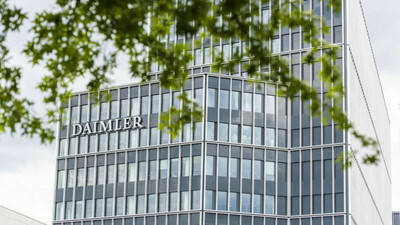 Daimler AG is one of the world’s most successful automotive companies. With its divisions Mercedes-Benz Cars, Daimler Trucks, Mercedes-Benz Vans, Daimler Buses and Daimler Financial Services, the Daimler Group is one of the biggest producers of premium cars and the world’s biggest manufacturer of commercial vehicles with a global reach. 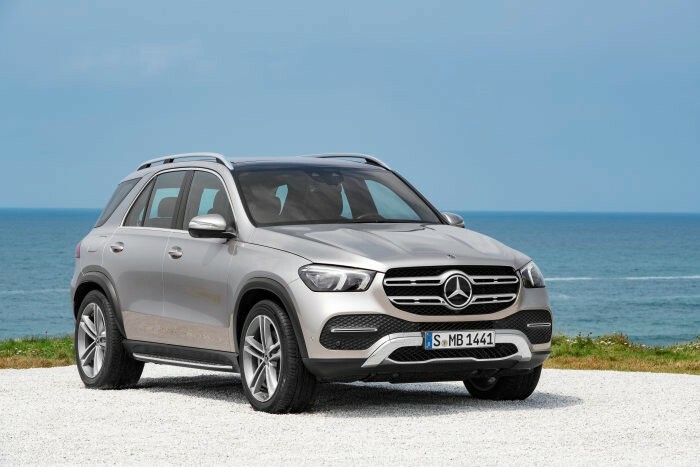 Daimler Financial Services provides financing, leasing, fleet management, insurance, financial investments, credit cards, and innovative mobility services. The company’s founders, Gottlieb Daimler and Carl Benz, made history with the invention of the automobile in the year 1886. 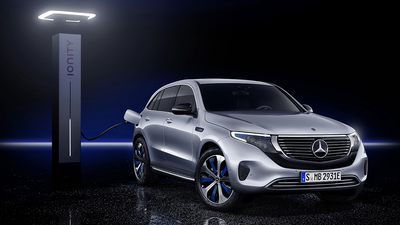 As a pioneer of automotive engineering, it is a motivation and commitment of Daimler to shape safely and sustainably the future of mobility: The Group’s focus is on innovative and green technologies as well as on safe and superior automobiles that appeal and fascinate. Daimler consequently invests in the development of efficient drive trains with the long-term goal of locally emission-free driving: from hightech combustion engines about hybrid vehicles to electric drive trains powered by battery or fuel cell. 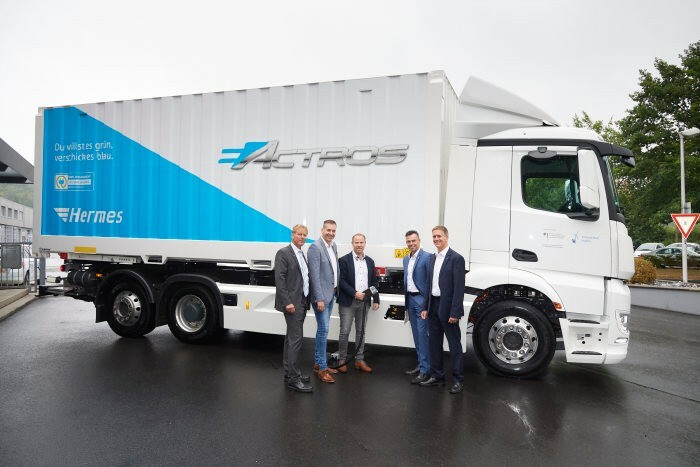 Furthermore, the company follows a consistent path towards intelligent connectivity of its vehicles, autonomous driving and new mobility concepts. This is just one example of how Daimler willingly accepts the challenge of meeting its responsibility towards society and the environment. 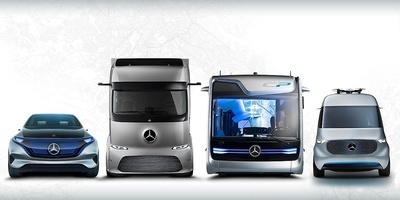 Daimler sells its vehicles and services in nearly all the countries of the world and has production facilities in Europe, North and South America, Asia, and Africa. Its current brand portfolio includes, in addition to the world’s most valuable premium automotive brand, Mercedes-Benz (Source: Interbrand-Study „The Anatomy of Growth“, 10/5/2016), as well as Mercedes-AMG, Mercedes-Maybach and Mercedes me, the brands smart, EQ, Freightliner, Western Star, BharatBenz, FUSO, Setra and Thomas Built Buses, and Daimler Financial Services’ brands: Mercedes-Benz Bank, Mercedes-Benz Financial Services, Daimler Truck Financial, moovel, car2go and mytaxi. The company is listed on the stock exchanges of Frankfurt and Stuttgart (stock exchange symbol DAI). In 2017, the Group sold around 3.3 million vehicles and employed a workforce of more than 289,300 people. With application of IFRS 15 and IFRS 9 in financial year 2017, Group revenue would have amounted to €164.2 billion and Group EBIT would have amounted to €14.3 billion. Before application of IFRS 15 and 9, Group revenue in 2017 amounted to €164.3 billion and Group EBIT amounted to €14.7 billion, as previously reported.